No, this isn't something Harry Potter stumbled upon in the Chamber Of Secrets. Believe it or not, this table belongs to our muggle world - Craig Thibodeau created it, and it reveals a series of hidden elements when examined closely. But it's not enough to locate the secret drawers - a lot of them open only with a push of a concealed button or a magnetic key. 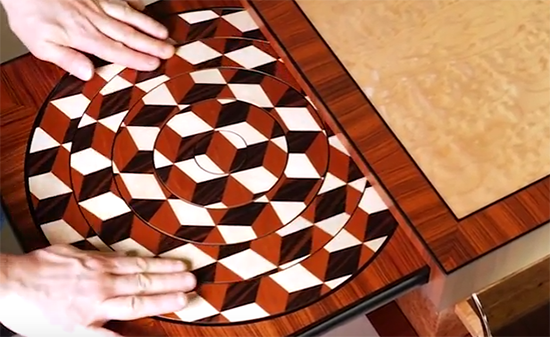 Thibodeau crafted this Sherlock Holmes of the table world inspired by the work of Abraham and David Roentgen, who specialized in highly complex mechanical furniture in the 18th century. Their client list included Marie Antoinette, King Frederick William II, and other secretive monarchs. Craig's piece is 20" wide, 20" deep and 34" high, and depending on the complexity and variety of hidden mechanisms the cost can easily exceed $35,000. Watch the video after secretly clicking the button.